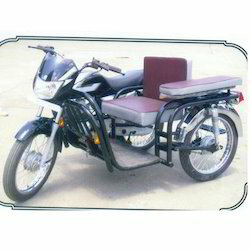 We are a leading Manufacturer of xl three wheeler modification, bajaj three wheeler modification, streak side wheel attachment, compact side wheel attachment, motorized three wheeler modifications and mahindra duro dz side wheel from Indore, India. 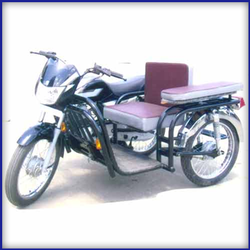 Our customers can avail a wide range of prominent automobile from us with including ISI mark Xl Three Wheeler for Handicapped. 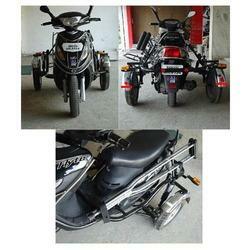 These wheelers are offered at reasonable rates in market with exclusive features. We ensure optimum quality of material and efficient performance. Our skilled and experienced workmanship makes the reliable and high features wheelers. These are made with utilizing mechanical and technical terms to assure timely delivery of services with flawless process. 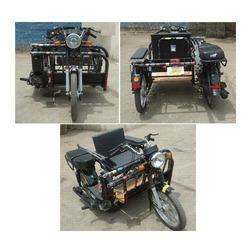 Modification Look Converted in three wheeler for use of divyang. 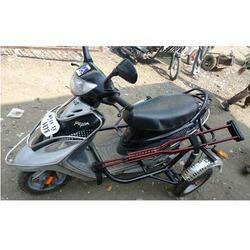 We are one of the well known manufacturers and suppliers of Bajaj Three Wheeler for Handicapped. These are high on demand due to their durability and the high performance which they give. These are made by using high quality materials which provide it with a lot of durable and give it a sturdy build. 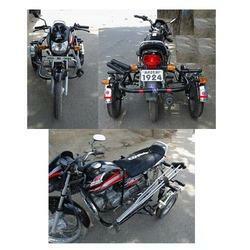 We offered these range of wheelers to the clients at very reasonable prices which can be easily afforded by the clients. We are involved in manufacturing an extensive array of Streak Side Wheel. Our engineered are widely appreciated for the known properties such as sturdy construction, user friendly functions and low maintenance costs. We have employed highly efficient engineers and workers in our company, who utilize their best skills in making flaw less wheels. We are one the leading manufacturer and supplier of Compact Side Wheel Attachment. 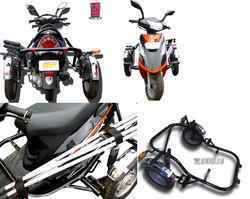 • Easy fit for any Hero and Honda Two wheelers. • We provide assembly and installation for all of our products at our facilities in Indore. We conduct free consultations for all prospective customers to see how we can fulfil your specific needs. 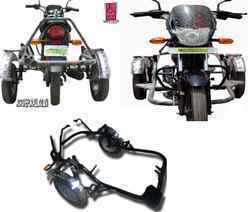 Owing to the vast industrial experience in this industry, we are a prominent manufacturers and suppliers of Motorized Three Wheeler. These are manufactured using premium automobile parts and quality grade material. Our products are made in accordance with the industrial standards and norms. We offer our products in various designs, shades and models. We are the top most manufacturer and supplier of Mahindra Duro DZ Side Wheel to the venerated clients, as per their unambiguous requirements. Under the experts we manufacture these products and designed in compliance with the international quality standards. The seats of these products are especially designed to give comfort and reduce stress to the user. Furthermore, to win the overall needs of the clients, we offer our wheels at very genuine rate. Pep Scooty Side Wheel is made using excellent quality of materials which are procured from well known vendors in the industry. These are very durable and have a long life, these are resistant to corrosion and provides and a high level of performance to the clients. We are known among the clients for the high quality of wheels which we supply and they are sold to the clients at leading market prices. Our firm is one of the recognized manufacturers and exporters of TVS Streak that are designed and developed as per the industry norms. These scooters comes with a wheelie bar for the disable people and old drivers who prefer a gentle ride, a speed control unit can be used. Our experts keep in mind to give smooth comfort, strong brakes and durable vehicle. These are easy to maintain and are straight forward installation. Leveraging on our industrious workforce, we deal in the manufacture and supply of Sport Side Wheel. We provide wide range of these wheels which are known for its effectual functioning among our valued clients. These wheels are easily adjusting in vehicles thus it helps to offer excellent balance, speed and smooth riding on roads. We are offered these wheels at very economical rates. With years of experience, we are engaged in manufacturing and supplying high quality Chair for Cerebral Palsy Kid These chairs are designed and developed as per the industry experts. In order to meet the individual requirements and demands of the clients, we offer our range in different specifications. Our chairs are offered within the promised time frame. These chairs are offered in proper packaging. 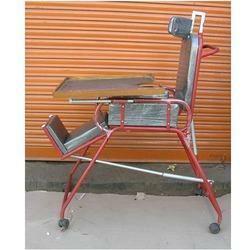 We are engaged in manufacturing and supplying of ISI Mark CD Deluxe for Handicapped. These are developed with highly advance technology to ensure the products as per the international quality standards. These are fully equipped with advance tool to meet the desired requirement of the client. Our ranges of products are known for its unique features like speedy function, excellent finishing and smooth riding. 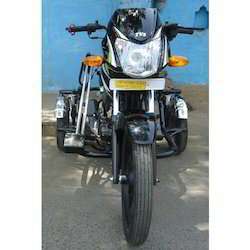 We are offering Bajaj Platina Motorcycle which is the most economic bike in the motorcycle segment. Reckoned for great performance and excellent mileage, these bikes are specially designed for physically challenge drivers, engineered and manufactured to ensure utmost comfort while driving. Elegant in design, these are fuel efficient and known for robust construction & excellent performance. 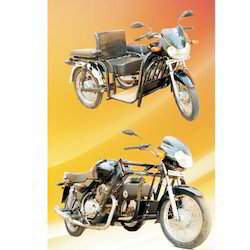 These bikes have larger wheel base and comfortable seating ensure stability on road and hassle free seating experience. 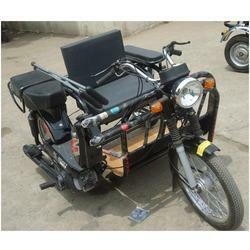 We are ahead our competitors in industry for manufacturing and supplying Bajaj CT Three Wheeler for Handicapped. We have adopted the innovative mechanisms in making these products that ensure their durability and increase their serving life. Owing to their unmatched quality, rugged construction, sturdiness, reliability and abrasion resistance, these products are broadly demanded and appreciated by our huge clientele. 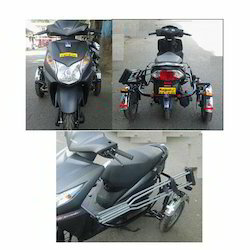 Our range of various automobiles includes TVS XL TW Handicapped Scooter, which are provided for specific scooters and with high quality of performance. 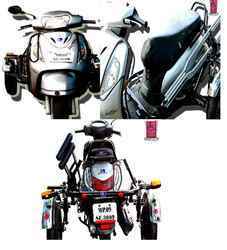 With ensuring trouble free and long service life of scooter, we are offering these scooters with advanced features. These can be availed by our clients at leading prices in industry. 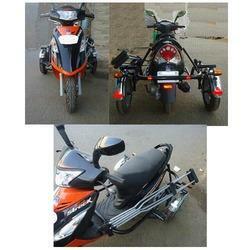 Our ranges of these prominent scooters are procured from leading and trusted vendors in market. With our long and rich experience in the field, we are able to manufacture a wide range of Suzuki Access for Handicapped that are of superior quality. We are equipped with modern machines and tools to fabricate these machines in compliance with industrial standards. Our range is known for its easy maintainability and straight forward installation and for its pocket friendly prices. These machines are available in pneumatic clutch and mechanical versions. 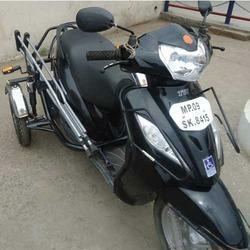 The Mahindra Flyte Handicapped Scooter are used for the purpose of giving comfort to the physically challenged people. 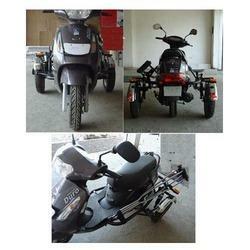 These scooters are high on demand in the market and they are offered at very reasonable rates to the client. 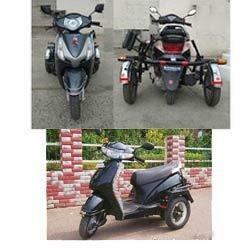 These are highly acclaimed for its efficiency and smooth drive in adverse conditions. The materials used for making the product are high on quality and they are procured from well known vendors in the industry who are reliable and hence the products give a high performance. 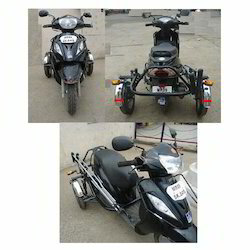 We are the manufacturer and supplier of TVS Wego Handicapped Scooter, which are specifically designed for disable people. These heavy duty powered scooter are fabricated using quality raw material such as stainless steel pipe and ms steel pipe. These scooters provide independent mobility of patient. These scooters ensure the comfortable journey of the user. These are available at minimal cost from us. We are involved in manufacturing an extensive array of Wego Side Wheel. Our engineered are widely appreciated for the known properties such as sturdy construction, user friendly functions and low maintenance costs. We have employed highly efficient engineers and workers in our company, who utilize their best skills in making flaw less wheels. Furthermore, to win the overall needs of the clients, we offer our wheels at very genuine rate. Leveraging upon our experienced team of professionals, we are able to manufacture, export and supply an assorted gamut of Dio Honda Handicapped Bike. Manufactured as per the international standards of quality using high quality components and advanced technology, this handicapped bike is stringently tested on various parameters by our experts. These are easy to handle and are ideal for comfortable journey. Customers can avail a wide range of Aviator Honda for Handicapped from us that are manufactured at par with international standards. These are made up of top quality material ensuring high durability. Our range is highly admired for their excellent performance and robust design. Our range is known for its easy maintainability and straightforward installation. Entire range is available at market leading prices. Looking for Vehicles for Handicapped ?